Description of "Dhatupatha Verbs in 5 Lakaras Vol3"
8. Knowing the PENULTIMATE Letter of each Dhatu. All of this has been lucidly explained and properly delved into, with a note on the Ashtadhyayi Sutras needed in deriving and conjugating Verbs. Dhatus have been listed in correct Panini order. 9. The Identical Roots across Conjugations have been properly Indexed. 10. Tag Letters of Roots have been Indexed based on each Tag Letter - Anubandha. 11. Internal Grouping of Roots has been given with Dhatu markers From - To. 12. KandvAdi Gana Roots have also been listed. This makes the book unique and a useful text for students of Vyakarana at the College and University Level. It also serves the purpose of the Vedanta Learners, especially those wishing to become intimate with the Language. 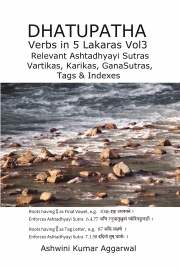 Reviews of "Dhatupatha Verbs in 5 Lakaras Vol3"